A Long March B launch vehicle lifts off. Photo courtesy of China Daily. [SatNews] Chinese satellite service companies are planning to form an alliance to expand their share of an increasingly competitive global market, industry insiders have stated. "We must combine our capacity through an alliance, which will enable us to share information and channels and complement each other," said Yin Liming, president of China Great Wall Industry Corp, the country's sole provider of commercial satellite launch services. "An alliance will also allow us to stand together to deal with obstacles in (foreign government) policies, legal affairs, financing as well as intellectual property rights when we expand in the global market." Wang Zhongguo, deputy head of international affairs at the China Hi-tech Industrialization Association, said the China International Satellite Service Association, which will consist of Chinese satellite operators, end user equipment manufacturers and major customers, is set to take shape soon. China has about 3 percent of the global satellite launch market, way behind its goal of 15 percent by 2020, Xinhua News Agency reported. Providing a package of services, rather than just launch services, can help Chinese companies differentiate themselves from US and European competitors, analysts said. "Chinese satellites and rockets have been known for their reliability and low prices in the international market for a long time. But as they are becoming more technologically advanced, the costs have also been on the rise, unquestionably affecting their competitiveness," Wang Ya'nan, deputy editor-in-chief of Aerospace Knowledge magazine, told China Daily on Monday. "On the other hand, a host of new players from Western nations have begun to grab contracts from traditional clients, which reflects the necessity and importance for Chinese enterprises to join hands in maintaining their place in the global market," he said. As of April, China had signed more than 80 agreements on space cooperation with about 30 nations and international organizations. 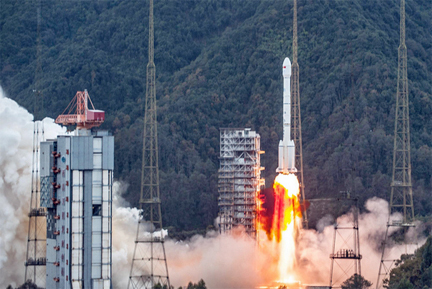 China Great Wall Industry Corp has also launched 39 rockets carrying 45 satellites for foreign clients since 1990, when it conducted its first international commercial launch. Yin said Chinese satellite companies should continue to hone their capabilities to provide better global services and diversify business solutions. "We must offer diverse solutions, products and services to better meet the needs of developing countries, especially in the fields of disaster relief and prevention, and geographic surveying."